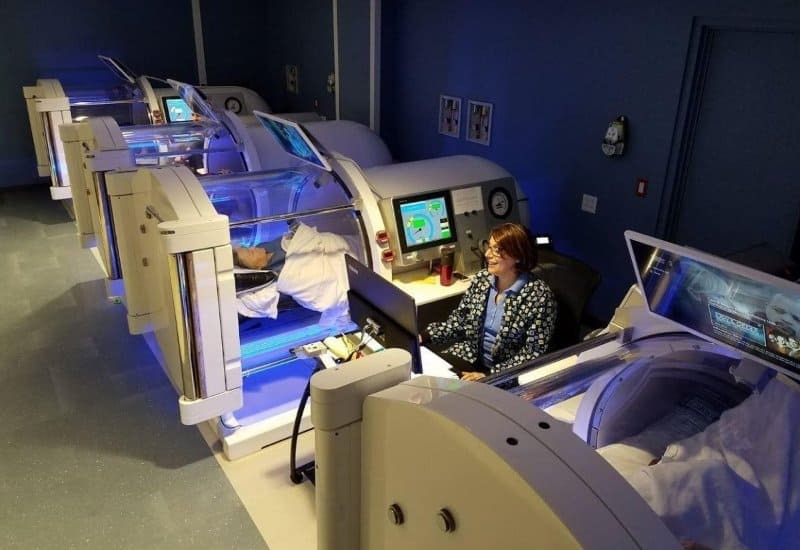 Tá Seomraí Teiripe Oxygen Hyperbaric Monoplace deartha chun cóireáil a dhéanamh ar othar amháin ag an am. Monoplace Ocsaigin Hyperbaric Cuirtear pressures ar chambers le 100% Leighis Grád Ocsaigin. Is féidir leis na hothair freisin Grád Aeir Leighis a theagasc le linn Sreabhadh Aeir nó trí Chóras Measca. Dearadh go cúramach le Cambers Tekna chun sábháilteacht agus compord othar a choinneáil i gcuimhne le linn na cóireála. An Árthach brú - ASME / PVHO / Leacht Brú an Bhoird Náisiúnta. An Console Oibriúcháin - Rialuithe Tumadóireachta / Cumarsáid / Córais Sábháilteachta. Sraitheoir Othair - Leaba Othair le maolú ceadaithe inbhainte. Soláthar Grád Ocsaigin Leighis - Uisce Bulc, Micrimhilseacháin nó VGL. Soláthar Aeir Grád Leighis - Comhbhrúiteoir Aeir Grád Leighis nó Sorcóirí. * Is féidir linn cabhrú leat do Imréiteach Sábháilteachta Dóiteáin a fháil i do shuíomh faoi seach. Samhail 4000 - 40 "
Samhail 3200 - 32 "
* Tar éis trastomhas 40 "is féidir leis an othar frithsheasmhacht claonta a úsáid. * Ní gá do sheasóirí comhtháite a bheith ag seasamh sreangáin agus tá claonadh inbhunaithe iontu.